Emerged was an other Hoffman challenge. The fabric had an element in the chrysanthemum petals that reminded me of butterfly scales. 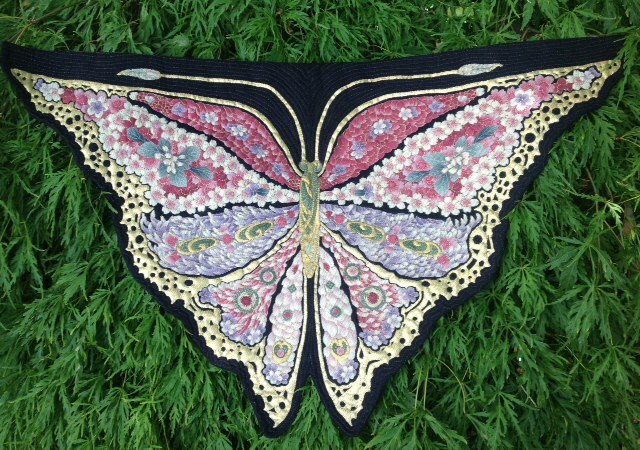 The element seemed so apparent to me that I assumed several butterfly quilts would be entered and almost went with another design. This was created with enraptured collage technique (under tulle). Only the challenge and the black background fabrics were used. Gold leaf paint finished the edges of the wings and antennas. This was the first Hoffman challenge entry I have had accepted, ironically.